Let me get this out of the way first; I’m a moron. Like, actually. I’m the type of person who’ll ask you where her car keys are while she’s driving, or the one who’ll ask if there’s dairy in ice cream. 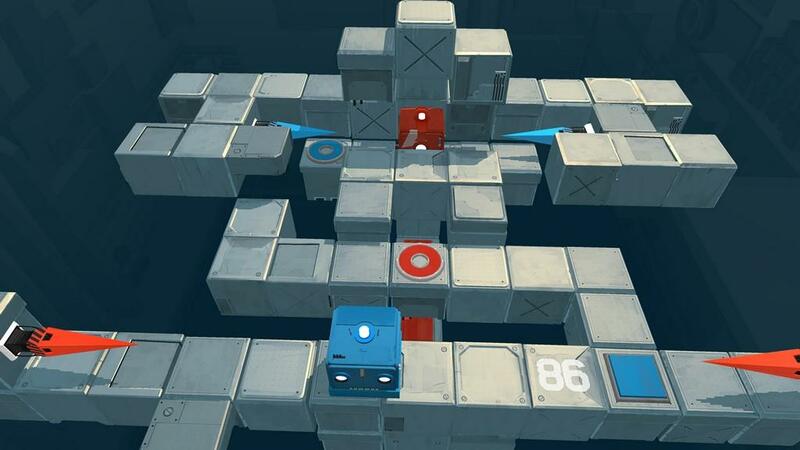 So whenever I’m asked to review puzzle games like Death Squared, I’m always convinced that I’ll be too dense to get past the ninth level. Allow me to say, though, that I’m pleasantly surprised; not only did I pass the ninth level, but I also passed all 80 story levels, and made it through the party levels with only minimal damage to my relationships with loved ones. Not only that, but it was neither too easy nor too hair-tearingly complicated, making it an overall enjoyable experience and a definite go-to for any group. If you happened to read my first impressions of this game, bear with me as I recap the premise. You play as an AI belonging to the company OmniCorp way off in 2066. Your task is to navigate deadly courses while your Testing Technician, David, supervises (and by that, I mean lazes the day away) alongside his own AI assistant. I’ll reiterate this point from the first impressions, too. If you take away nothing else from this review, take away this; I don’t care how good you are or how much you practice, because you are going to die an unholy amount of times. I mentioned before that this game is a destroyer of relationships. Now that I have fully completed story mode and party mode, allow me to correct myself; this game is an executioner of relationships. Think Mario Kart. I thought that the team-killing was intense in story mode, where you play with one other person (and can share a keyboard). In party mode, which can hold four people (and requires controllers), it’s even more cutthroat. There are no friends here. But here’s a twist; it’s a cooperative game. A cooperative game where I’m almost up to a thousand deaths. Now, it’s not often that I see a game and go “Wow, this would be great to play with both my adult friends and whatever elementary schoolers I happen to know,” but this one fits the bill for many reasons. This is coming from someone who’s played it with family, friends, and girlfriend alike, and had an absolute blast each time. I only really have a couple of complaints, but I’ll get to those. 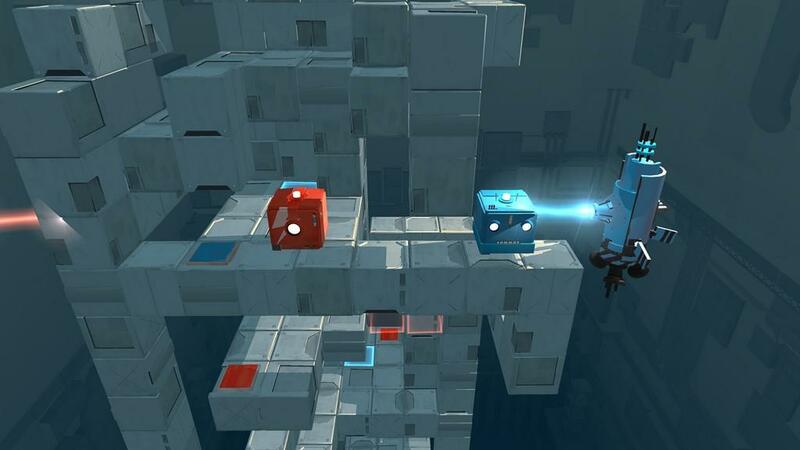 In this world of cubes and puzzles, you have to work together to beat each level, whether you’ve got two players or four. 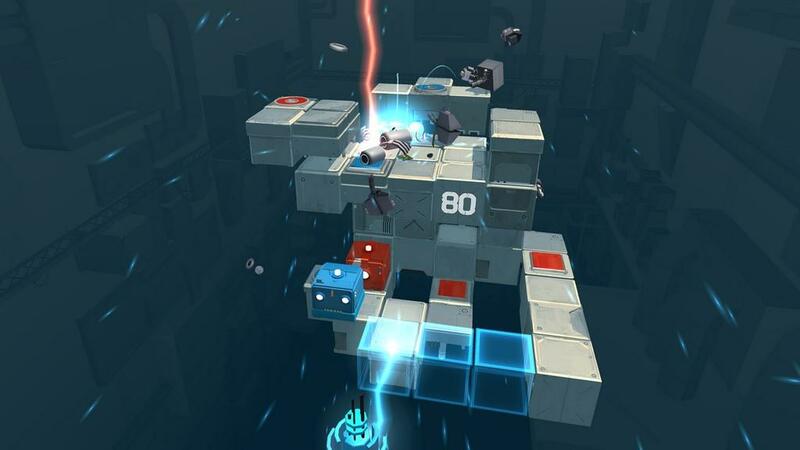 In a lot of co-op puzzle games I’ve played, I tend to notice a big imbalance in player functions; usually one player will have more of a role than the others. For instance, Player One will have to push a block here, press a button there, run across the level in less than x seconds, and activate a trap or two, while Player Two will just stand on a big button and maybe provide support now and again. 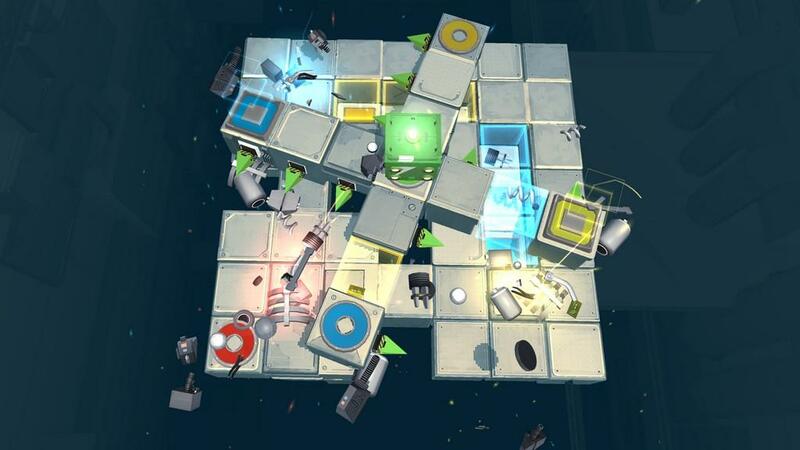 Not so in Death Squared. Regardless of player number, everyone always has a role to play, and rarely did anyone find themselves sitting idle for a reason other than “I need to stand idle for timing purposes.” Naturally, this is great for both children and squirrely adults (especially adults who get a little too friendly with team-killing when they’re bored). 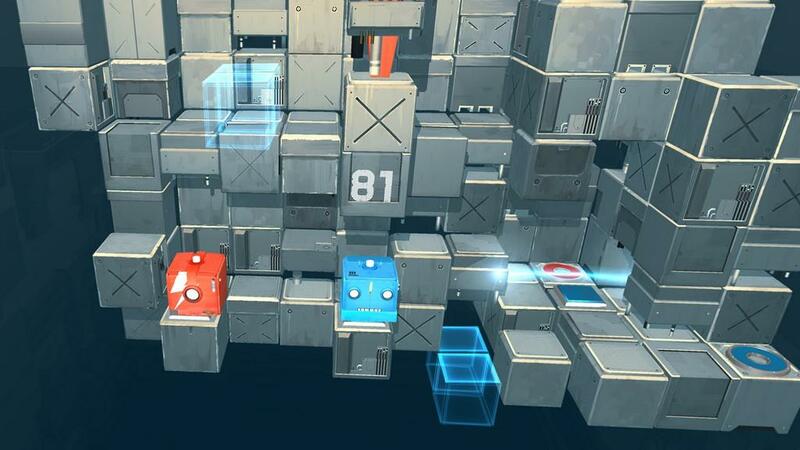 No one wants to play a puzzle game where they watch someone else do all the fun stuff. That being said, trial and error is a huge game mechanic. You’re gonna die; get used to it. If there’s one thing I can attest to, though, it’s that you’ll have a lot of fun failing. The difficulty of the puzzles increases as you go, but there’s no point where it suddenly spikes; it’s a pretty smooth increase throughout both story mode and party mode. 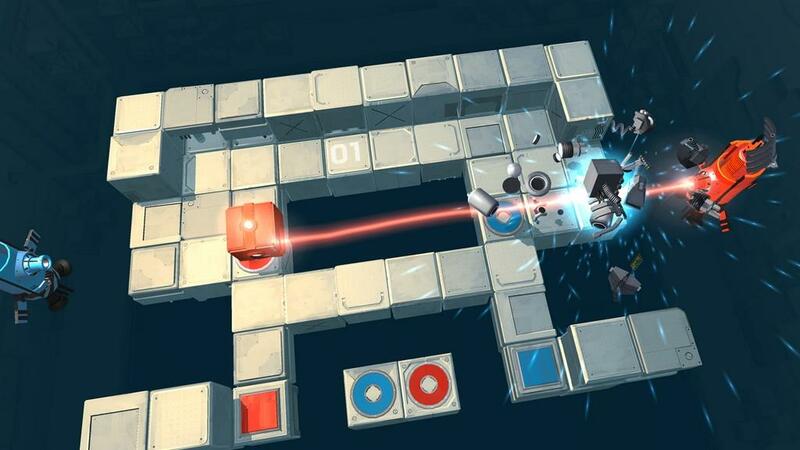 New mechanics and devices are introduced fairly gradually, so it’s not like you’ll get a laser and a moving block and a button all at once for the first time and be told to deal with it. The pacing is pretty close to perfect, and I—the person with the memory of a chipmunk—never forgot how any one of them worked. Of course, I mean that I never forgot how to activate them. 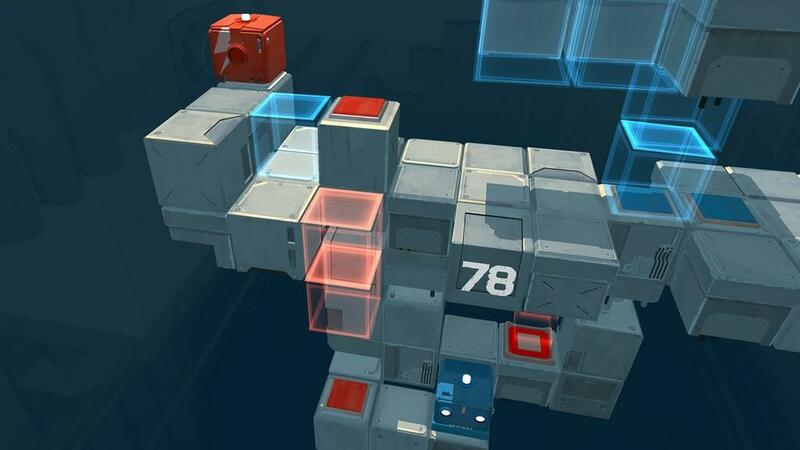 You stand on a button, block a laser, push a block, trip a tripwire, etc. That’s not to say that each of them do the same thing. 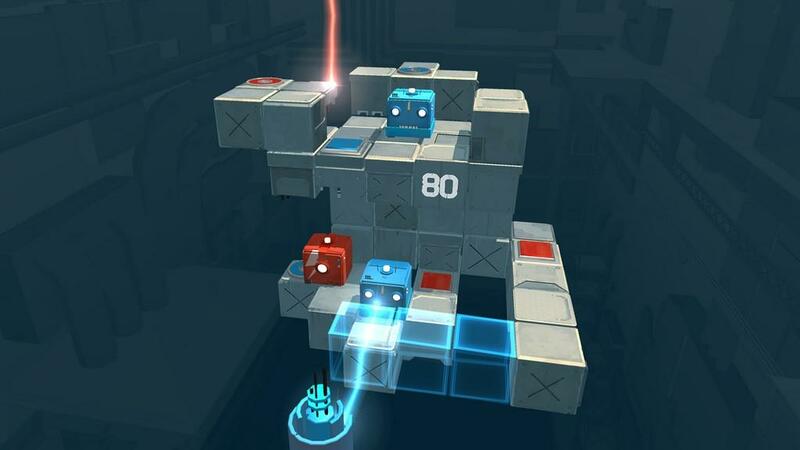 It switches between rounds, so if a blue button activates a laser on Level X then there’s nothing guaranteeing it’ll do the same thing on Level Y. The fun part is that many of them trigger deadly traps, and the even more fun part is that half the time, you’ll never see any of them coming. 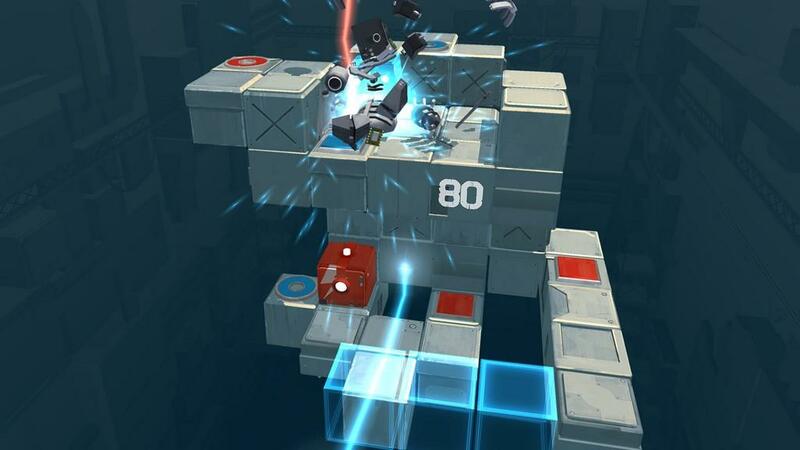 We’re talking spikes from every direction, moving blocks, lasers, momentum—you name it. 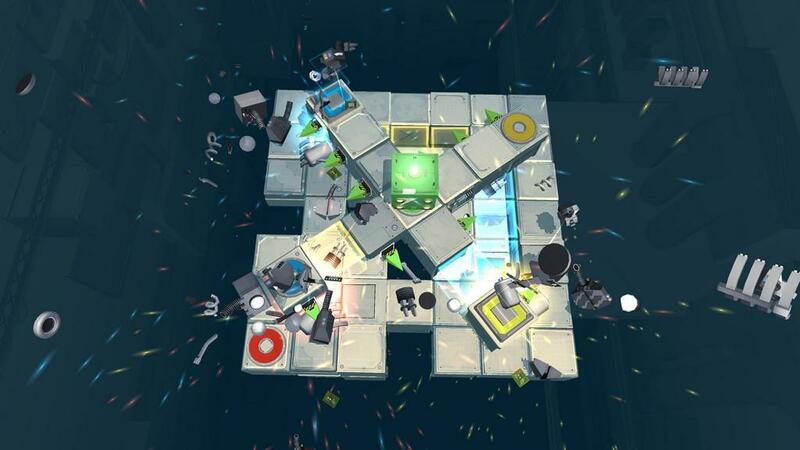 There are plenty of ways to meet your end in a little robotic explosion, and that’s not even counting how many ways your teammates can shove you off the edge of the level. If cutthroat cooperation were ever a thing, this game would embody it. Don’t worry, though; there’s no real penalty for dying, aside from the shame you might feel when looking at the death counter. You just get dropped at the spawn point of the level with all mechanisms reset, along with anyone you’re playing with. That brings me to another thing I love about this game; there’s pretty much zero loading time between deaths. It’s the epitome of instant gratification. Course, it’s not easy, either. 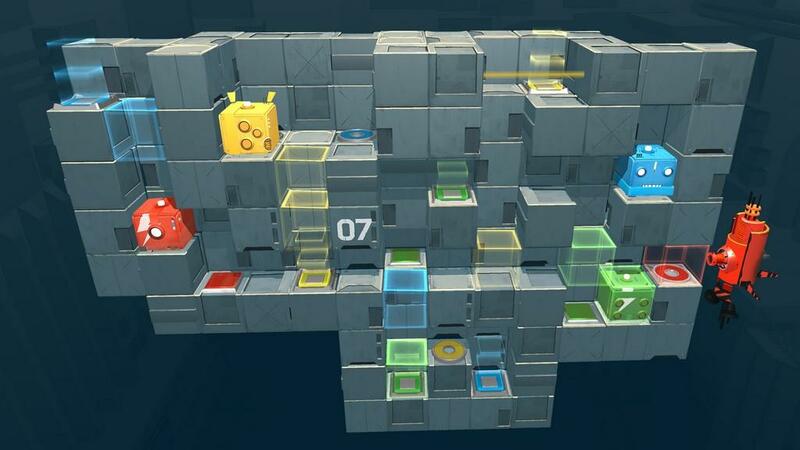 It’s not fun to play a puzzle game where you breeze through each level in 30 seconds. The short respawn just makes it way more bearable to die twice every minute. I do have to bring up my negative points eventually, but they’re not huge flaws—just things that need to be mentioned, as every game has. First off, some context; my parents, whom I had already planned to drive home and visit, graciously agreed to be my guinea pigs for party mode. However, not having played through story mode, they were going into it completely blind. Throughout, they noted to me that they were having some difficulty keeping the colors straight. Now, some context on that; within the game, the various mechanisms I’ve discussed can only be activated by someone of the corresponding color (blue buttons can only be activated by Blue, and so on) or so I thought. There are also holographic blocks, which behave as solid blocks unless it’s the same color as you, and tripwires, which can be tripped no matter what color you are. If you have a friend who’s jumping into this game midway through, chances are they’ll be a bit confused on what does what, so bear that in mind. It’s much, much better to let them dip their toes in the shallows before you toss them into the deep end. That being said, my parents both enjoyed the game. There’s something to be said about the fact that, while being hopelessly confused for good chunks of the time, they were still having fun with it all. My other complaint was the story itself. Of course, being a puzzle game, plot isn’t meant to be its core selling point, but my philosophy on that whole thing is basically “go big or go home.” If you’re going to implement plot, you can’t skimp on it. While the storyline going on in the background of the game is nice to listen to, it took me about fifty levels to realize that it was a storyline and not just background talking to make the experience more interesting. From there, it kind of sped up exponentially, the stakes shooting up much faster than felt natural until it culminated in what felt kind of like a deus ex machina at work. As a closing remark, I would like to put forward an opinion from my father, one of my much appreciated guinea pigs. Bear in mind that this man does not like puzzle games, and pretty much exclusively plays World of Warcraft, Diablo III, and Civilization VI. However, when we got into the game, I kept looking over to see him laughing, furrowing his brow in thought, and trying to avoid me as I ruthlessly came after him with the intent of team-killing. 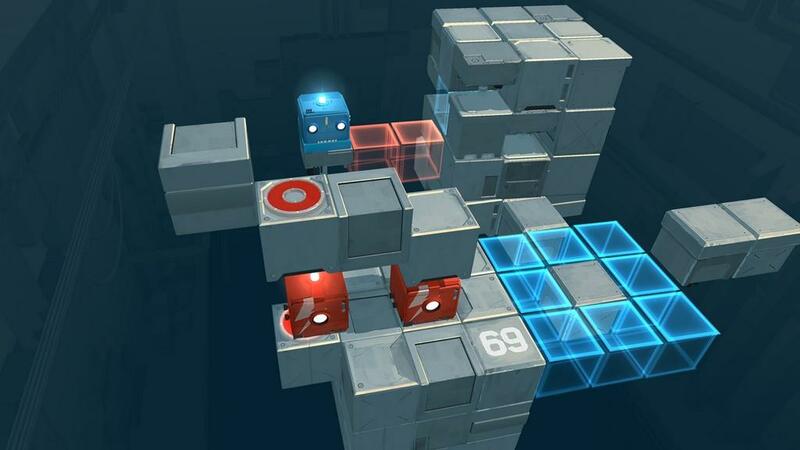 So, with his words in mind—“I hate puzzle games, but I really liked this one”—can we really deny that this is a solid game? 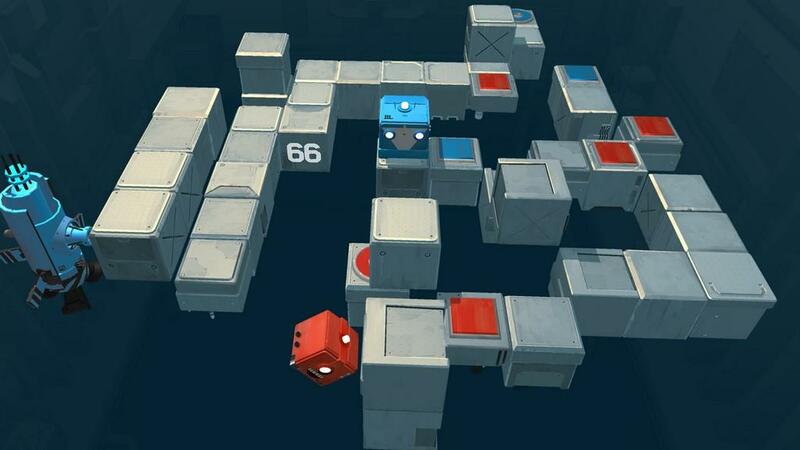 While not perfect, Death Squared is pretty darn close to it. This game should be a go-to for any age group who’s looking for a small party game that could keep them occupied for hours. 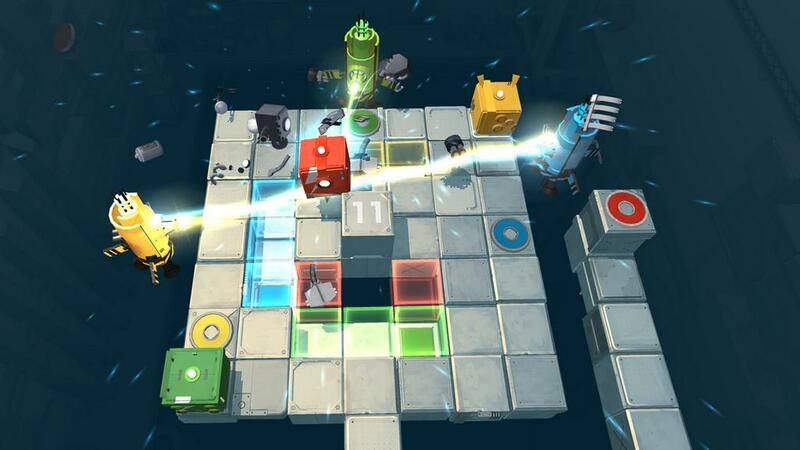 You’ll rarely be bored with the puzzles, rarely be frustrated with the mechanics, and rarely annoyed by anything other than excessive team-killing (which is hysterical in its own right). 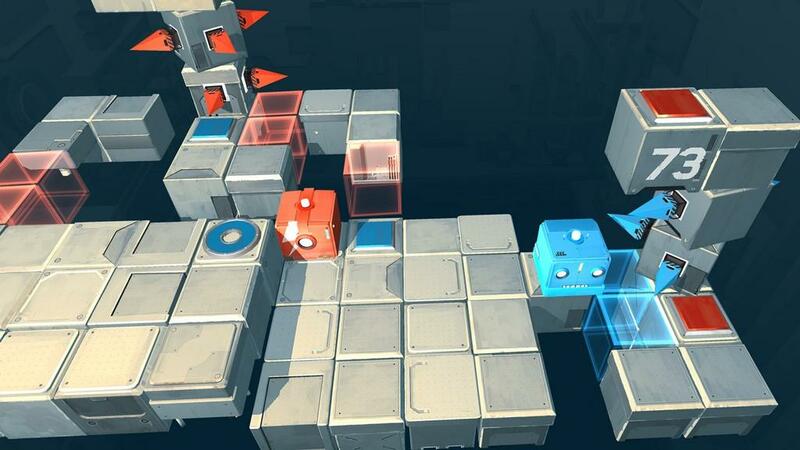 If you’re looking for a puzzle game to play with someone who doesn’t like puzzles, this is the one.